FlashRay lives! All-flash FAS is now a price/performance beast – which now comes with a substantial price cut. NetApp is doubling down on its 3-product all-flash arrays; the EF Series, All-Flash FAS (AFF) and FlashRay with its Mars operating system. Yes, FlashRay lives and has not been gobbled up and absorbed into the FAS product line. AFF8000, or All-Flash FAS 8000, is available in four models: FAS8020, AS8040, FAS8060 and FAS8080, which can come in FlexPod converged systems. Performance is good. It provides up to four million IOPS; a 15TB Oracle database on the all-flash FAS8080 averaged a 370 microsecond latency time. We understand an AFF8000 SPC-1 benchmark report is being prepared which will burnish the product’s performance credentials. NetApp says WAFL, ONTAP’s Write Anywhere File Layout, has write characteristics well-suited to flash, happily, while its read performance is respectable but not outstanding. A set of tweaks to ONTAP, called Flash Essentials, includes things to speed the read path in ONTAP. Inline deduplication and compression is also being added to ONTAP but not to the same extent as to Mars. The FlashRay OS will have, we understand, better data reduction; inline dedupe all the time whereas AFF inline dedupe is not, we understand, constant. Price/performance has been re-evaluated by NetApp and Lee Caswell, veep for Product and Solutions Marketing at NetApp, said: “We will cut the street price of all-flash FAS by 40 per cent [and] will undercut Dell” – and its all-flash Storage Centre. Pricing will be as low as $5/GB, taking the NetApp AFF into the $25,000 starting price territory. He talked about NetApp being the only supplier being able to offer data storage in the F2D2C sense, from Flash to Disk to Cloud, with NetApp’s Data Fabric idea of using ONTSp to seamlessly manage data on-premises and in hybrid and public clouds as being the over-arching construct. 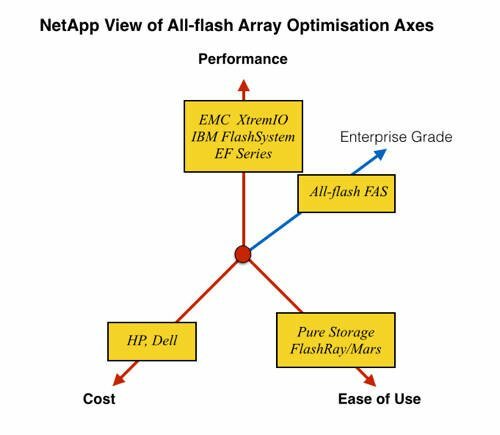 In NetApp’s view there are three existing axes of optimisation for all-flash arrays: performance; cost; and ease of use. Caswell positioned IBM (FlashSystem) and EMC (XtremIO) on the performance axis. HP and Dell are on the cost axis, with Pure Storage being on what he calls the ease-of-use axis. He placed NetApp’s EF Series on the performance axis, with its simple, block-only, non-deduped array controlled by its SANtricity software. Caswell said: “We think the performance market is contained and application-specific,” meaning “not that large”, we think. He mentioned NV-DIMM territory as one aspect of this, meaning SanDisk and its ULLtraDIMMs. 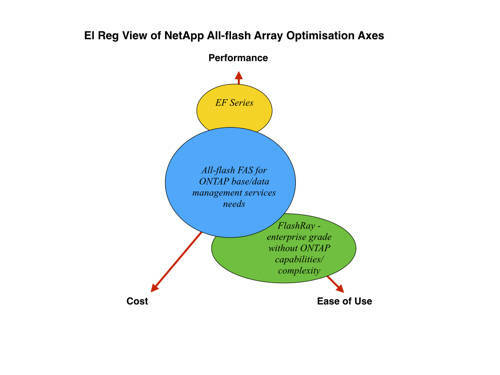 The rejuvenated (in El Reg’s view) FlashRay is on the ease-of-use axis and is NetApp’s product to pursue new business opportunities, ones that the EF Series and AFF are not best suited for. Contrary to previous reports and assumptions, FlashRay is neither dead not being assimilated into the FAS ONTAP product line. The Mars OS has a simpler code-base than ONTAP. It makes, Caswell said, consumer-grade MLC flash reliable and fast. It;s a SAN-only offering, not unified like and block like ONTAP. Think, he said, of flash at the edge and hybrid at the core. With its 40 per cent cut in its street price cut you would think AFF is placed on the cost axis. Instead Caswell positions it on a new axis called enterprise-grade because AFF is optimised, we think he means, uniquely for enterprise flash use. This gives us relatively clear positioning of the three products without implying that only the AFF is enterprise grade while Dell, EMC, HDS, HP, and EMC AFAs are not. Yes, NetApp can argue its products are “more” enterprise grade but not that the other’s are not; enterprises are buying them. Further testing and completion of the dual controller, high-availability FlashRay array with Mars OS is being carried out. Caswell said: ”We’re more committed than ever,” to flash and FlashRay. We were also told that NetApp will lead with a flash offering first, hybrid flash and disk second. Also, its flash offerings will be partner-led. Some of these changes to its products and strategies pre-dated George Kurian’s appointment as CEO but he has given their implementation added urgency.